Two members of the CHS girls Cross Country Team will be advancing to the November 3 state meet including junior Maggie Marshall who finished fifth at Monday's Region II race. Teammate Caitlyn Cron was the 12th runner across the line, posting a time of 19:03 to place her among the state qualifiers. Cleburne competed as a team at the Region II race after taking second at the District 14-5A contest held October 12 at the Cleburne Sports Complex. Both Lady Jackets entered Monday’s meet as District individual medalists. Marshall, who took the silver at the District meet, shaved 60 seconds off her time to cross the line at 18:27 at today’s contest. Cron, who finished fourth, was 37 seconds faster than what she ran at District. The last time Cleburne competed at the state level was in 2015, when Reagan Mead raced for the Jackets. Mead was a three-time state qualifier, going on to sign with the men’s XC program at Texas Tech University, where he currently competes. Marshall and Cron will be accompanied to state by Coach Alicia Johnson, who is in her first year as head of the Cleburne XC program following two years as assistant. 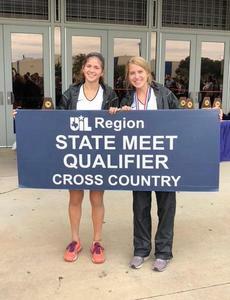 Caitlyn Cron and Maggie Marshall display their good news, following their performances at the Region II Cross Country Championships. Marshall placed fifth at the Regional race, with Cron posting a 12th place finish and a state-qualifying time.